Even someone who has a major in music education can have a hard time distinguishing a marimba from a xylophone. Why? They look similar and they produce nearly the same sounds. However, despite the many similarities, the two musical instruments are actually completely different from each other, as you will find out in this article. The marimba is a musical instrument that belongs to the tuned percussion family. It has wooden bars arranged like piano keys (specifically for chromatic marimbas) and resonators suspended underneath the bars. It has a warm tone color and its range can be three to five octaves. Originally, the marimba was constructed using Honduras Rosewood (for the bars) and gourds (for the resonators). These days, however, the bars can be made from different types of wood (e.g. Padauk, Bubinga, or Mahogany) and the resonators can be made from carved wood, aluminum, or other synthetic materials for added durability and weather resistance. Further, the marimba mallets are covered with yarn or are uncovered rubber, and the mallet shaft can be made from wood or fiberglass. Mallets that are too hard should not be used as they may damage the bars, affecting the sound quality the marimba produces. To produce musical notes, the marimba player or “marimbist” strikes the wooden bars with mallets. Using a number of techniques, multiple mallets can be held in the same hand (two or even four, depending on the skill of the player). Softer mallets are perfect for the low keys, while the harder types are perfect for high notes. The wider and longer bars produce low-pitched notes, while the thin and short bars produce high-pitched notes. The marimba originated in Central America and is the national instrument of Guatemala and Costa Rica. Nowadays, it is played in several countries outside Central America. It’s unique, mellow tones are great in solo performances, woodwind, brass, and jazz ensembles, marching bands, orchestral compositions, and drum and bugle corps. The xylophone is a percussive instrument that has a series of wooden bars which are struck by two or four mallets to produce sounds. It has a range of two to four octaves and produces short, sharp sounds. 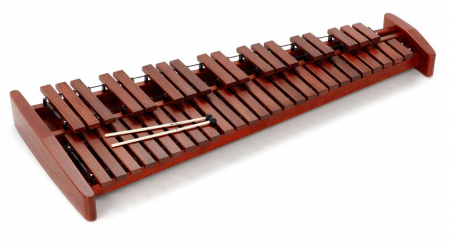 The bars of the xylophone are typically made from rosewood or padauk wood; however, they can also be made from fiberglass or plastic. Mallets usually are made with tough rubber, poly ball, or acrylic. Yarn mallets may also be used for softer effects and wooden-headed mallets can be used for lighter tones. The xylophone typically has no resonators, but orchestral xylophones may have metal tubes underneath to amplify and sustain the sounds. The exact origin of the xylophone is lost in history. It is believed that people from Asia and Africa independently developed the early xylophone as early as the 14th century. Originally, the wooden bars were arranged in a ladder-like layout and placed on hollow gourds to amplify the notes. Traditional mallets were made of willow wood carved like spoons. Today, the xylophone is often used in an orchestra and other instrumental groups because of its unique sound. What, then, is the difference between a marimba and a xylophone? The marimba was developed in Central America, whereas the xylophone was simultaneously developed in Asia and Africa. 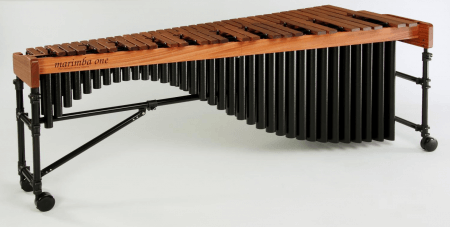 The marimba can be identified easily by its aluminum or wooden resonators. It can be played with two, four, or even eight mallets. Conversely, the xylophone typically has no resonators, although orchestral xylophones may have resonators made of metal. It is typically played with two mallets although some players can play with four. The marimba has a mellow sound and is one octave lower than a xylophone. It can be played solo or in an ensemble. On the other hand, the xylophone has a brittle, metallic sound, an octave higher than the marimba in range. It is always part of an orchestra or a musical group.